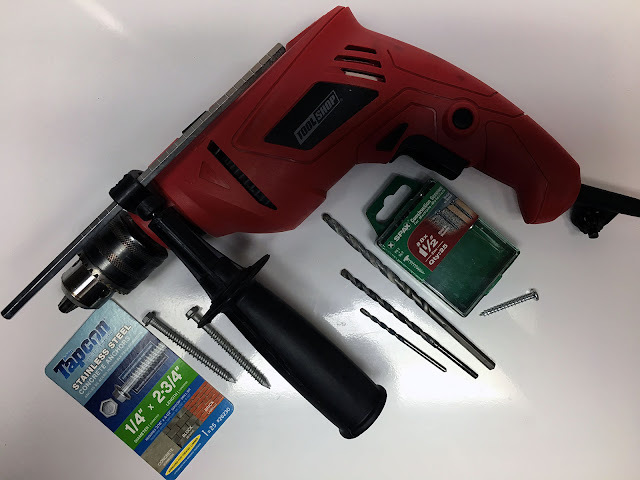 The main reason for do-it-yourself home repair is that you can have something in your life that is unaffordable any other way. 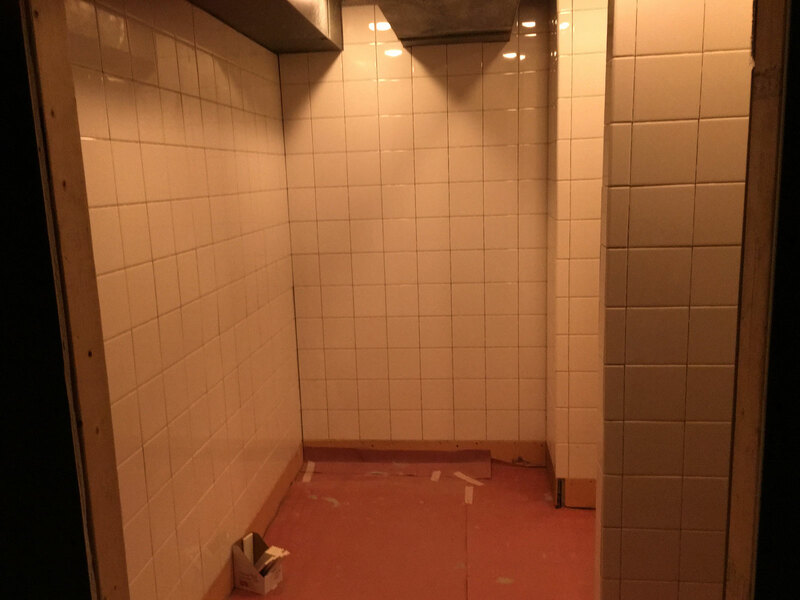 Pictured here is my new rest-and-towel-off area built on the site of one of the nastier basement bathrooms ever seen or imagined. Among its many features it has an ADA-approved low-slip tile floor, knurled, high-grip, stainless-steel grab bars, an ergonomically excellent bench, and an LED lighting system that delivers almost 100 lumens / sq. ft. It is safe, comfortable, and aesthetically quite pleasant. And best of all, it was built with some of the lowest-cost materials sold in the big-box building supply store in my little town�for example the ceramic wall tile only cost $1.52 / sq. ft. ($16.36 / sq. meter). Careful and extensive planning is essential. No one changes the world quite like the builders. And when the builders got really serious about their applied art, they produced the Industrial Revolution. The greatest errors in economics stem directly from a deep ignorance of the tool-users and what their role in society really is. So I build because I never want to lose touch with these people. It is what separates the economic thinking of this blog from virtually every other economics site on the internet. Unless one categorizes Ben Franklin and Peter Cooper as economists, there are no historical examples of economists who were graceful tool-users. Of course the greatest political economist of them all, Thorstein Veblen, built simple things�which mostly proves my point about how rare it is for the tool-users to be even mentioned in economic debates. 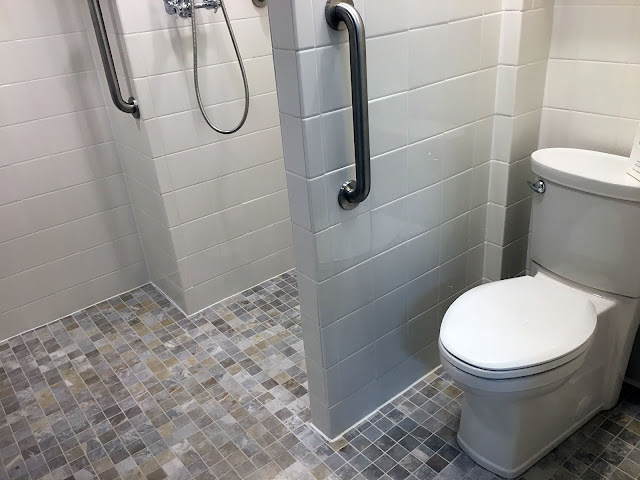 Even so, I look at my rebuilt bathroom and am filled with the calm assurance that very likely no other political economist in history could have built it. And this fact alone significantly explains why so many got so much horribly and disastrously wrong. It is impossible to accurately explain human society without accounting for the tool-users. Moreover, tool-using constitutes a knowledge that is rarely found in books�this is something you must do. I must admit that most of these lessons had been learned long ago. But this time around, I thought a lot about the intersection between competence and honesty (mostly inspired by the hilarious debate in the movie The Big Short over whether it was fraud or stupidity that drove the housing bubble that crashed in 2007-8). Besides cost containment, my main goal was to have a well-made outcome. Like any such project, there were many jobs I had not done before. When that never-been-done-before job appears, the most important assignment is to take an honest and thorough inventory of the possible assets that can bring this task to a successful conclusion. Is there a Youtube of someone doing the same thing? Do I have the right tools for fabrication? Can I purchase suitable raw materials? Is the planned method within my skill set? etc. Of course, when there isn't a relevant example to copy, you are thrown into the world of invention where all these steps must be repeated with a lot less help. In these situations where outcomes are less certain, the margin for dishonest self assessment drops to ZERO. Turns out, once again, that the most important core ingredient of competency is honesty. Unfortunately, this will be my last such project. I recently turned 68 and physically I cannot do it anymore. Especially if only to prove an epistemological point. 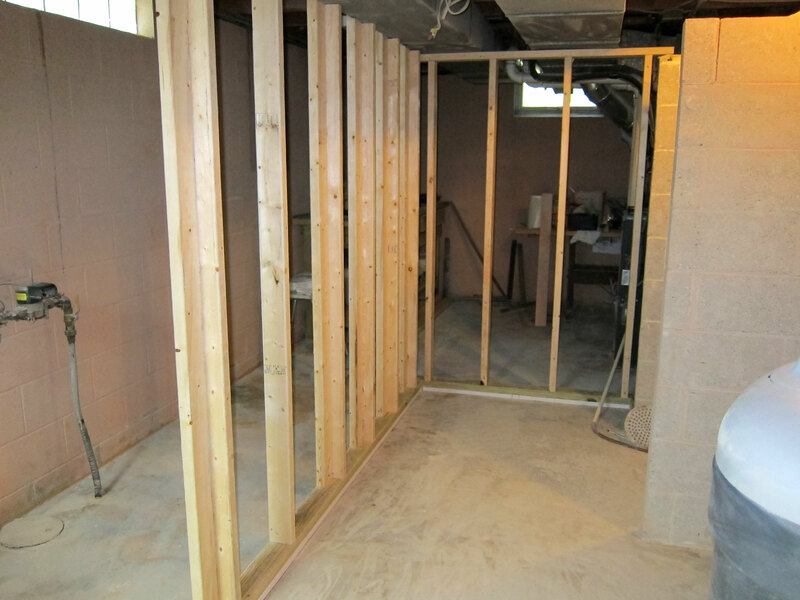 This project was conducted in a cellar which means everything had to be hauled down a flight of stairs. Some construction materials are pretty damn heavy and clumsy. But I DO enjoy my repaired bathroom. The details of how it was done can be found by clicking the Read more button below. The nastiest surprises our 1958 house presented were the bathrooms. 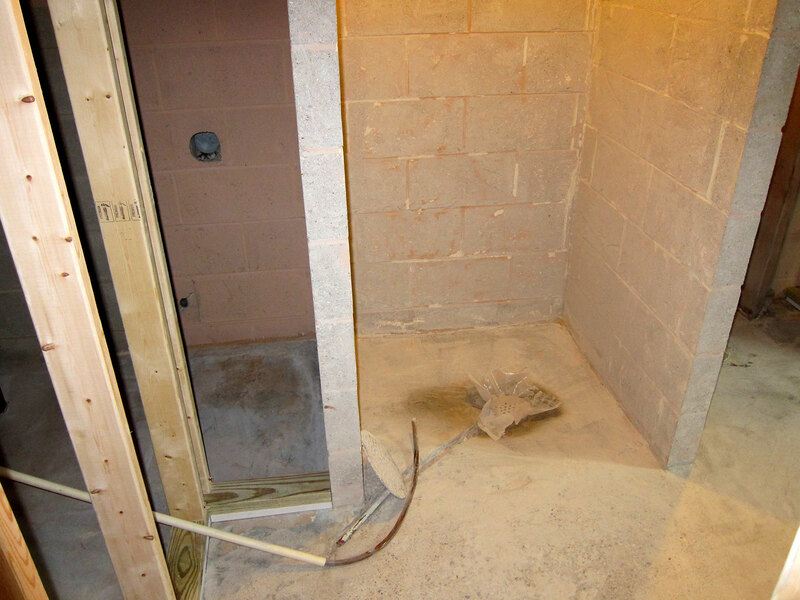 The upstair bathroom had been basically leaking since it was built because of an improperly-leveled bathtub. There had been several attempts over the years to fix the leak but the root problem was never addressed. My guess is that it wasn't even recognized. Worse, because the bathroom was absolutely vital to the family, any attempted fix had been by definition, quick and messy. The account of our fix was posted back in July of 2015. 1) It was impossible to clean. The floor was poured concrete that had been painted a couple of times over the years. Even so, mistargeted emissions around the toilet bowl over time had actually removed the paint. 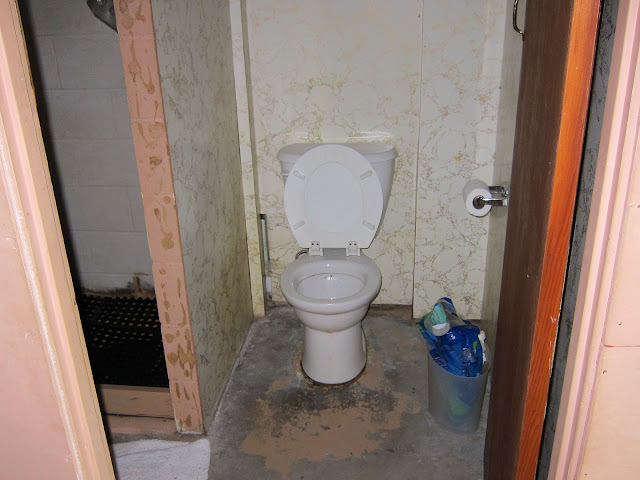 The shower stall floor was infected with all sorts of molds and mildews growing in soap scum and accumulated dead skin. These were impossible to remove because the floor never dried out. Most of the walls were constructed of a cheap fiberboard that would destroy itself if it ever got wet�it was also ugly and printed to look like someone's idea of marble. From the time I would enter that room until I started to sneeze was usually less than a minute. 2) The slope to the shower drain was dangerously steep. The concrete was well-laid and cured�in over 50 years it has sprouted NO hairline (or worse) cracks anywhere I could see. Unfortunately, The floor's contour was not well done. The floor slopes from the center of the house to the outside walls. The result is that there was too much concrete near where the shower's floor drain was attached to the main stack. 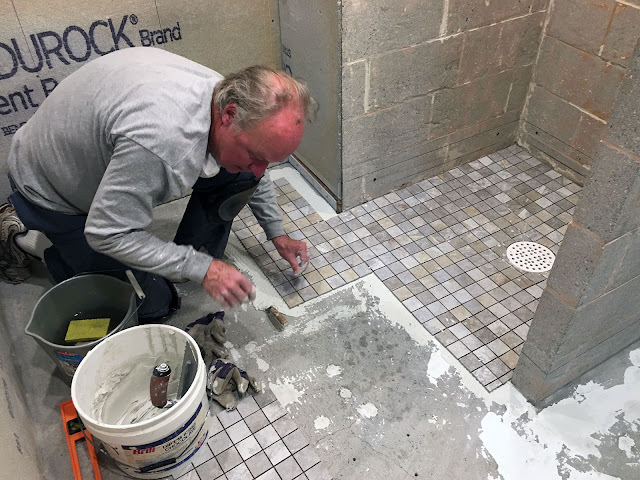 So rather than move around a lot of concrete, the original finishers just troweled a round edge from the floor down to the drain�a drop of over three inches. So in the middle of the shower was an over seven inch diameter "pothole" deep enough so a misstep could do some serious damage to an ankle or foot. 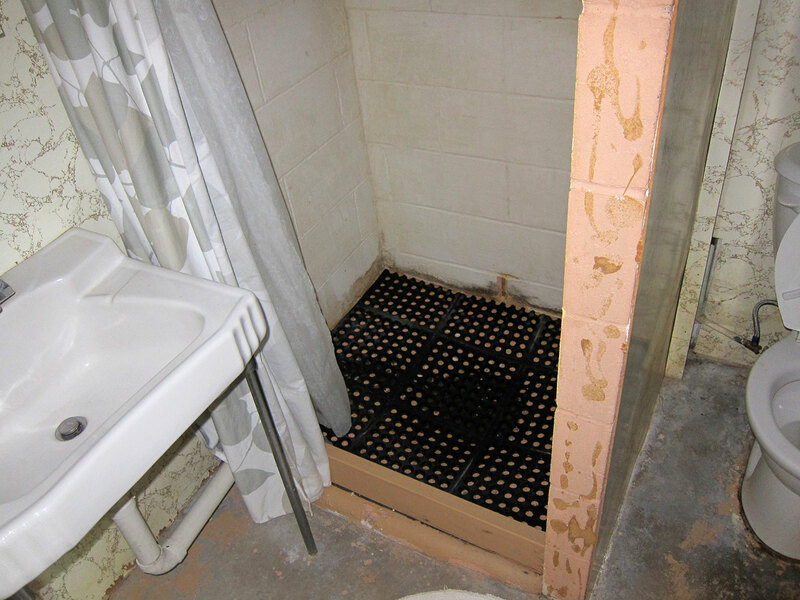 The basic floor slope was the wrong direction so the original cement finishers troweled a half-round kerb to keep the water contained in the shower area. It was soon discovered that this was not enough so someone had installed a 2 x 4 to raise its height. I thought this board across the shower door dangerous and ugly and removed it. It took only one shower to realize that board really was necessary because without it, water escaped the shower area, ran across the floor, and out the door. 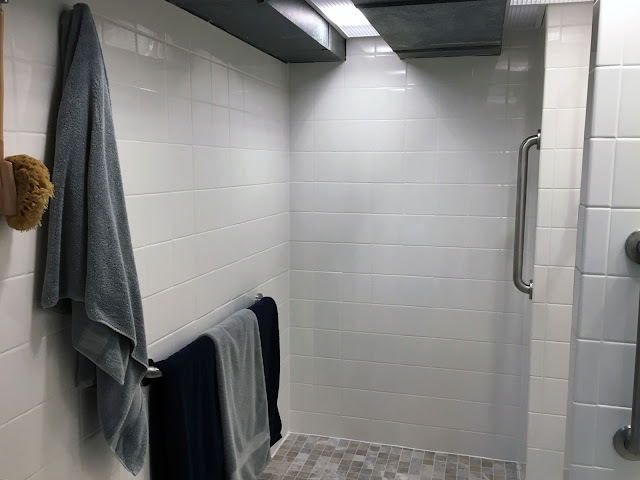 3) The entrance to the shower area was so narrow as to make access nearly impossible�and other problems that came from cramming a washbasin into a too-small room. A bathroom needed a place to wash up, went the logic, so a sink was installed that was not plumbed into the waste stack. Instead the drain just ran out onto the shower floor. Worse the sink shrunk the shower opening by half which meant stepping over a 2 x 4 set on edge onto a wet floor with a major hole in the middle through an opening roughly 18" wide. Trying to clean that floor meant working through the same reduced opening. Even crazier, there is a perfectly good laundry tub less than four feet from the bathroom door. If all you needed to do is wash your hands, this was perfectly fine. 4) The lighting was dismal. There were two (mismatched) light fixtures above the washbasin. The shower itself was quite dark when the curtain was pulled and the light in the toilet area was very weak. Not only was this darkness a sanitation issue, but what good is a toilet if it is so dark you cannot read while using it. 5) The whole room was so small it was almost impossible to towel off. The "logic" of small bathrooms totally escapes me. 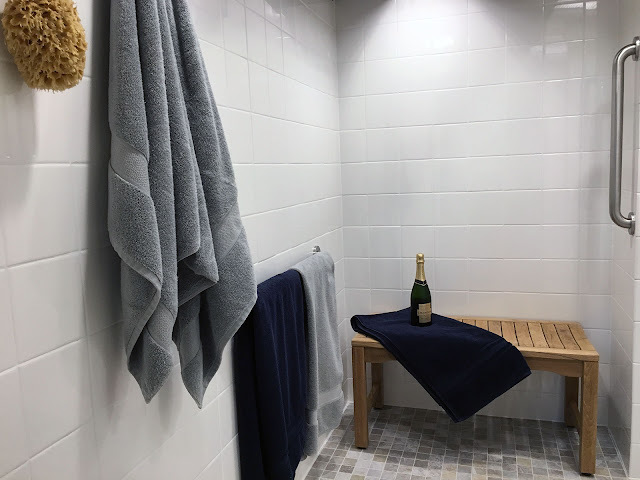 Considering how much time is actually spent in bathrooms, making them too small seems almost insane�especially in a house that has a "dining room" that gets used about twice a year. I am 6"2" and to towel off my back, I was forced to go out into the hall. To save a few square feet in a basement that has lots of unused space can only be explained by some 1950s dictate of fashion. Make the shower floor safe to walk on without looking and make sure all water in the room at least ran towards the drain. Make the surfaces durable and easy to clean. Get some serious light in the space. 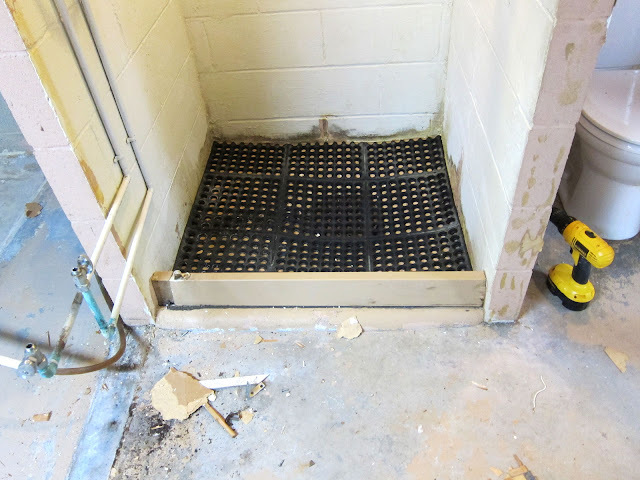 Get rid of the systems that kept the shower floor wet. Push back the walls by small amounts to relieve the claustrophobia-inducing space. (In the end, the floor area would expand by 14.8 sq. ft (1.37 sq. m)�doesn't seem like much but it completely changed the character of the room). Install plenty of grab bars, use high-traction floor tiles, widen the door to make it wheelchair-friendly, install a taller toilet, and do whatever else made it safer. 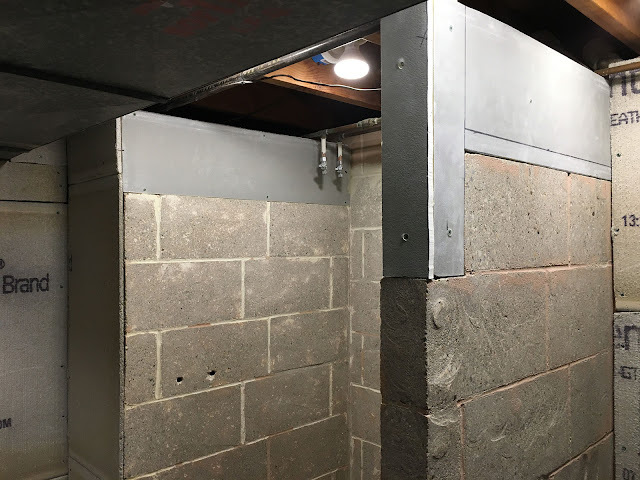 Since the original bathroom actually functioned, after a fashion, as a toilet and shower, we intended to keep the concrete stub walls, the water supply, and the over-sized drain attached to the main waste stack. 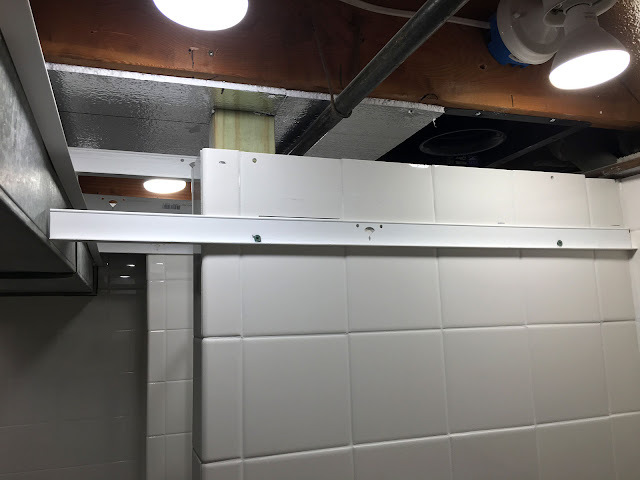 So in theory it was supposed to be a matter of simply replacing surfaces and fixtures�how hard could this be? Plenty difficult as it turned out. With a low ceiling and excess concrete surrounding the shower drain, the "obvious" solution to the drainage problems would be to remove material from the floor. This decision turned into one of the bigger construction mistakes of my life. Yes a diamond wheel can pretty easily grind away 50+ y.o. concrete. The problem is that the resulting dust is almost impossible to control. We tried to drape off the work area. We tried to put a vacuum attachment on the grinder. We tried wetting down the concrete. All attempts at dust control were laughable in the face of the choking clouds of dust a grinder could create in an enclosed space. Our dust masks were clogged in minutes. Eye protection was soon caked with a blinding layer of dust. After a few hours (and some progress) we concluded we had to try another way. The dust flew just everywhere. I was finding new hiding places for this fine dust for weeks. 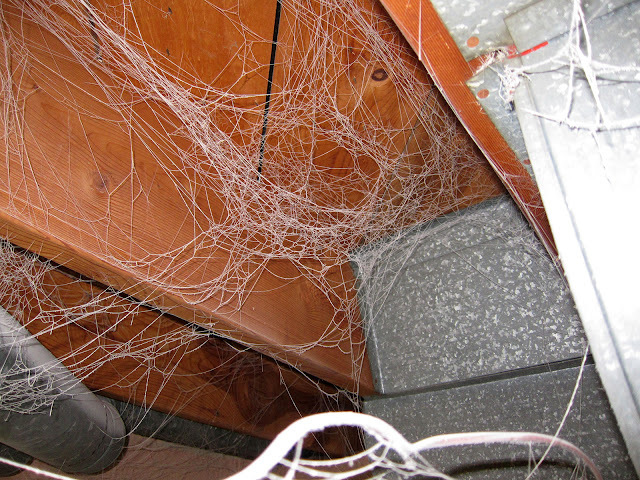 Here it highlights cobwebs in a ceiling area behind the furnace�a dark place not really seen by human eyes since the house was first finished. 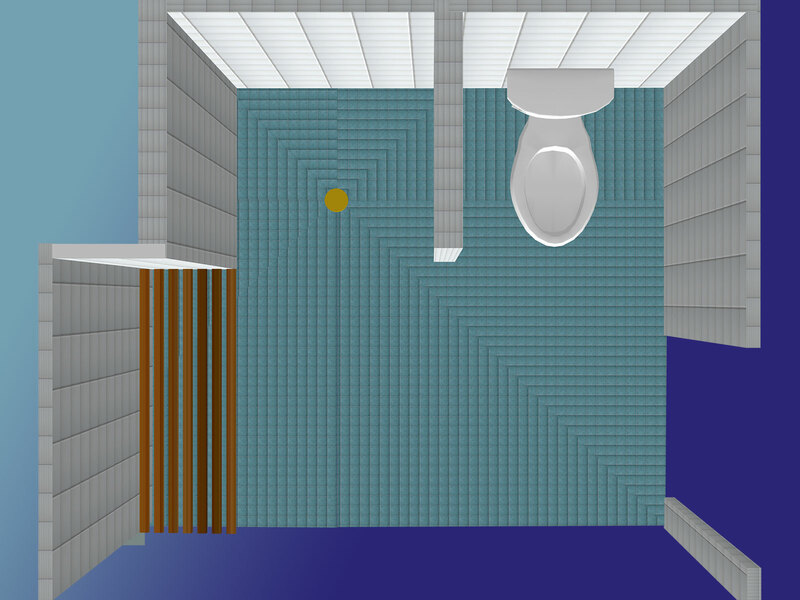 Wanting all parts of the floor to eventually drain to the shower was difficult to understand conceptually because the room was not a rectangle and the drain (yellow) was not in the middle. So I constructed sloping floor parts in my favorite 3d illustration program and pushed and rotated them until I had some understanding of how they would intersect. 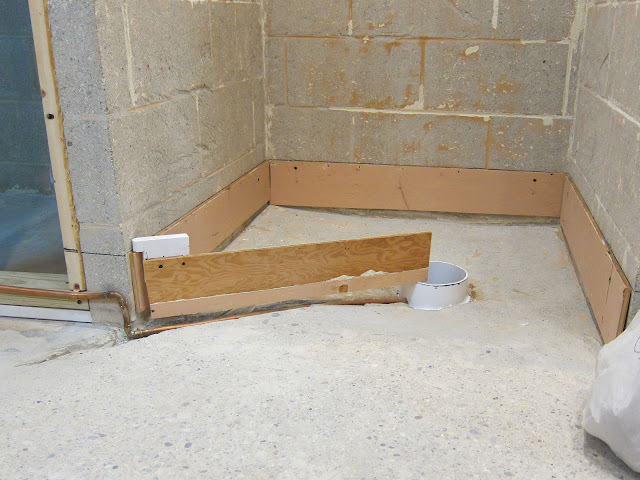 This proved enormously helpful and I determined that all surfaces should be on some line between the new drain opening and a level line surrounding the perimeter of the room. A friend loaned me this fabulous laser level, a German-designed jewel of a tool called a Stabila LAX300. In less than 20 minutes, I had every vertical surface marked in relation to each other (see the red laser lines on the studs). It only took a few seconds for me to want one of these devices. The new drain height had to be defined first. A 6" PVC splice would serve as the form for the new concrete. The top mark corresponds to the mark from the laser level. The second mark down was the maximum height of the existing floor (upper left corner) or the maximum height of the new floor. The lower mark represented the recommended slope for shower drainage�or the new drain cover height. 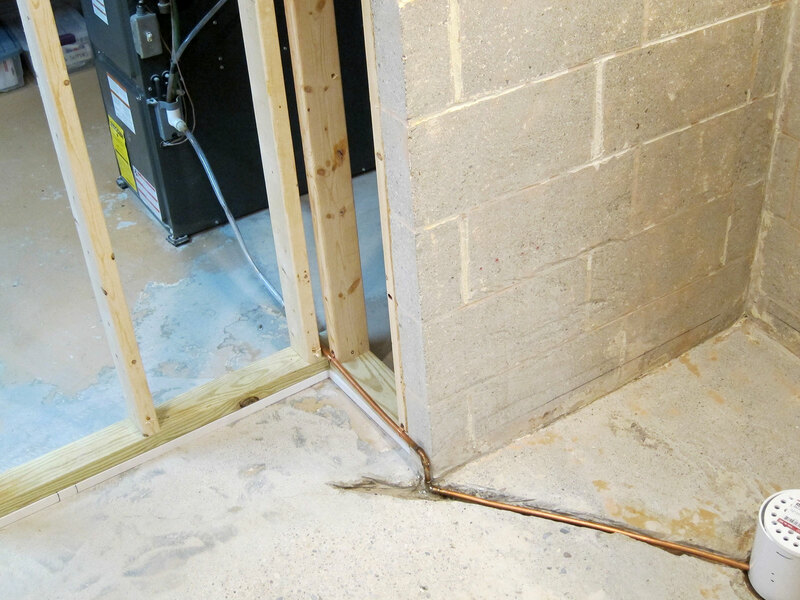 The copper pipe would be connected to the furnace's drainage system. A screed board that spans the distance between the wall's perimeter and the drain height extension has been fabricated using a PVC "hook" that could be adjusted with some pretty high precision. The new floor height would be determined by the underside of this screed. 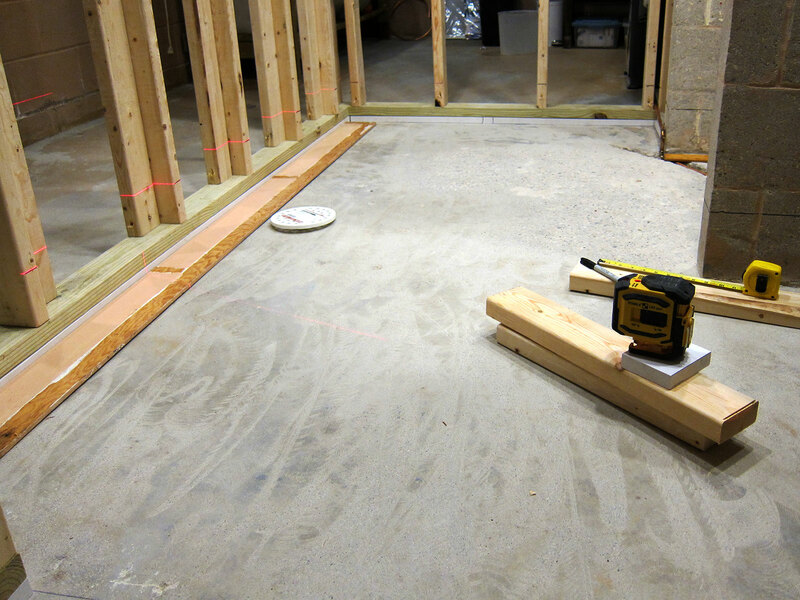 A much longer screed would be necessary to re-contour the rest of the room, Note how far out of level the old floor was�no wonder the water that escaped the shower stall just kept running across the floor. It required 640 lbs (290 kg) of sand mix to reshape the floor. Spent a lot of time fretting about my contour decisions but once they were set in concrete, there was little I could do about them anyway. The floor might require a slight slope but the platform for the toilet had to be level. 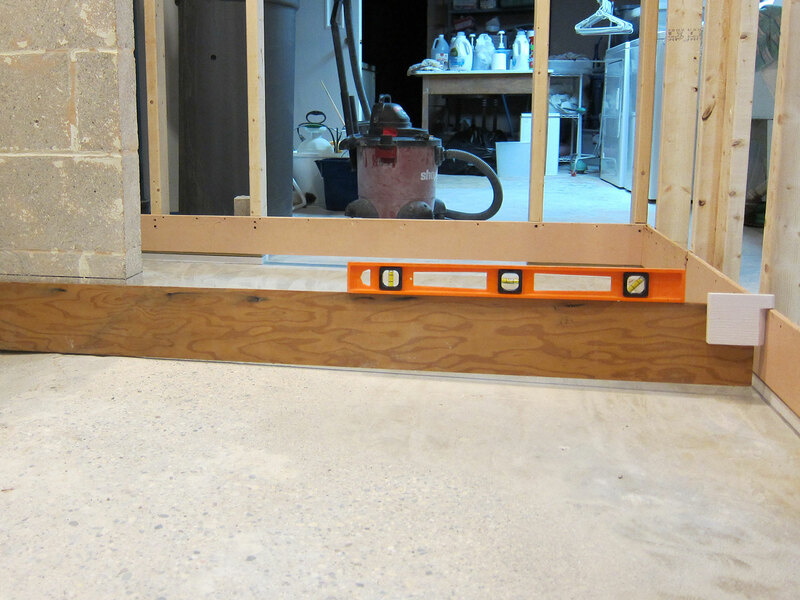 Here the new level base is checked against the rest of the floor to ensure that the floor tiles could accommodate the difference. 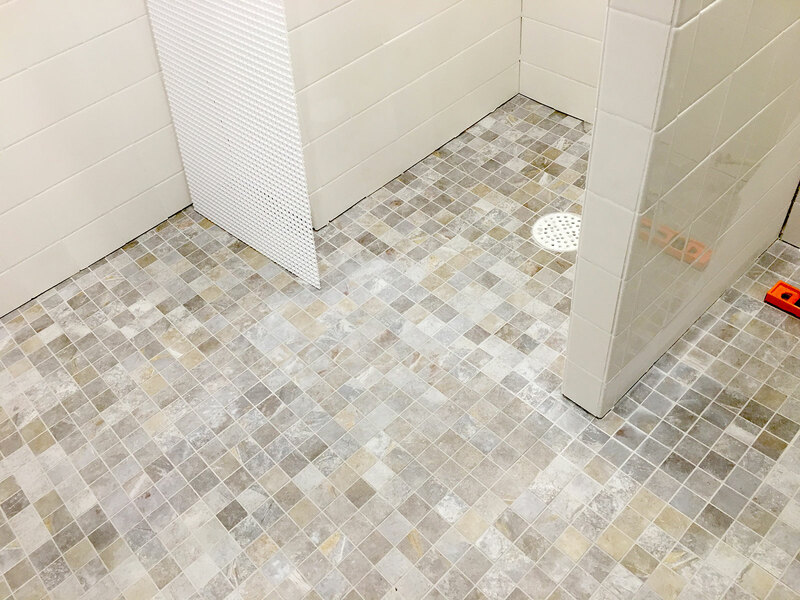 The whole goal was to tile without trim. 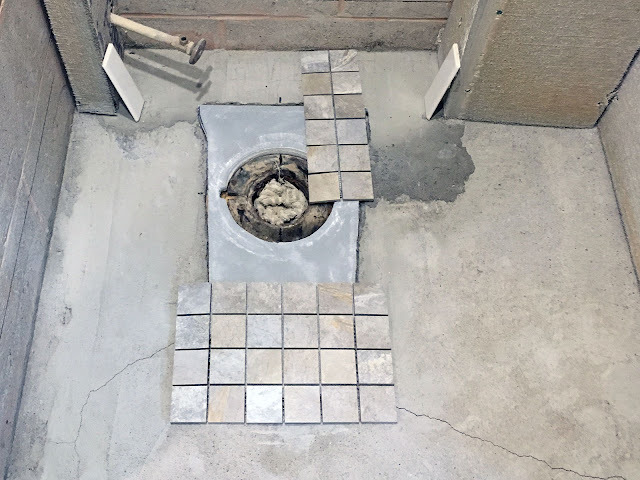 This meant, among other things, carefully cutting small porcelain tiles to fit around a drain cover and set them on a curved and sloping surface. My friend and I worked pretty well together because our skill sets complimented each other's. I have almost no hand skills so over the years, I have become a systems guy. For me accuracy is always a function of tools and fixtures. My friend has incredibly skilled hands�he can play Beethoven on the piano. So I cut the tiles and he pushed them into place. Once the floor tiles had been set, the ledger boards were screwed back into place for the wall tile. Same laser lines were used. We used over 900 wall tiles. For a couple of old amateurs, that was a LOT of work. And yes, the new LEDs can be dimmed to this color and intensity. 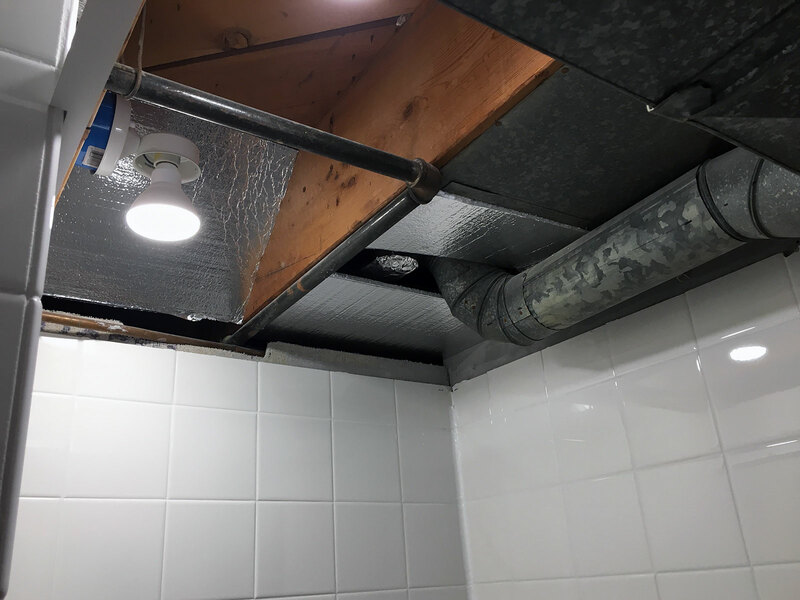 The structure that hid some pipes had to be tiled. 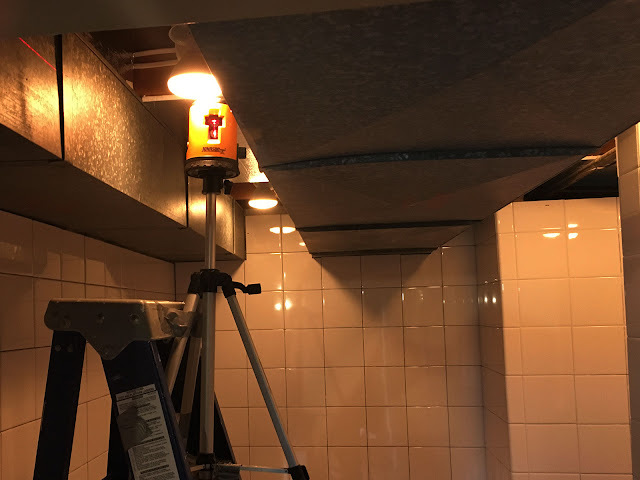 This job included tiling a little "ceiling." I had never done this before so I watched a couple of Youtubes on the subject. They acted like there was nothing to it. I was skeptical. As you can see, my Plan B includes room on the side where I could attach some sort of scaffolding to keep the tiles in place until dry. 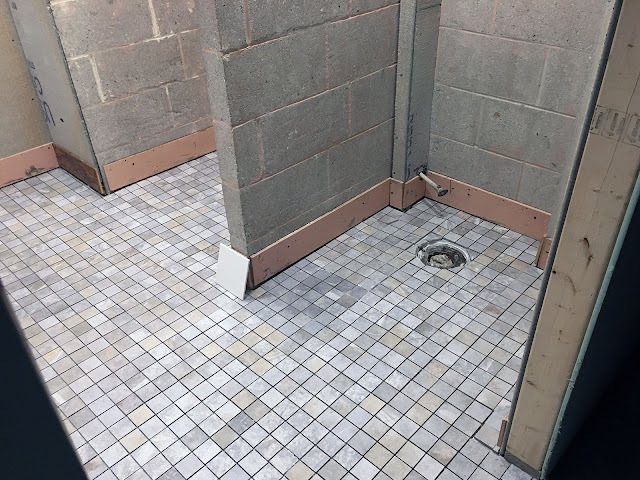 Well, we pushed the tiles into place and they stayed there without problem. After cleanup, it dawned on me why we should have never doubted this would work so long as there was enough thinset to completely seal the tile's edges. Do the math. On a 6" x 6" tile there are 36 square inches of surface. 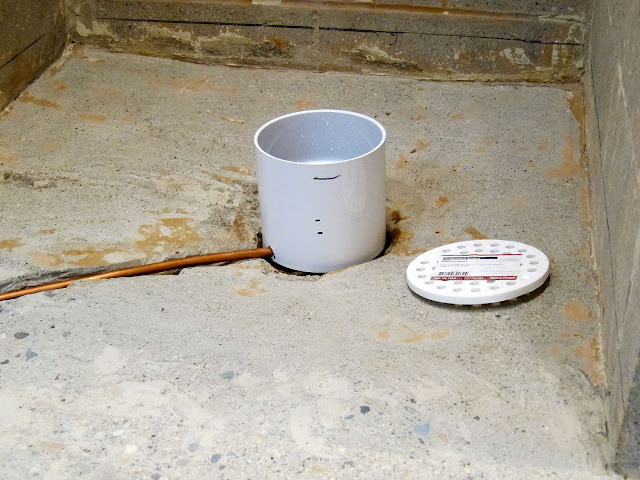 At standard atmospheric pressure (14.7 p.s.i or 1,013.25 � 10 3 dynes per square centimeter) there are 529 pounds of pressure holding the tile in place and less than one pound of gravity trying to drop it to the floor. Some caulk for the corners and this tile job is DONE! Lighting was easily the most exciting part of this venture. LEDs have come a long way. Six 800 lumen (11 watt) light fixtures would be installed�giving me 4800 lumens in less than 48 sq. ft. This isn't watch-assembly levels but it is above the minimums for SAD lighting. There will be no excuses for not getting things clean. With so much light, the need to dim things down was pretty obvious. 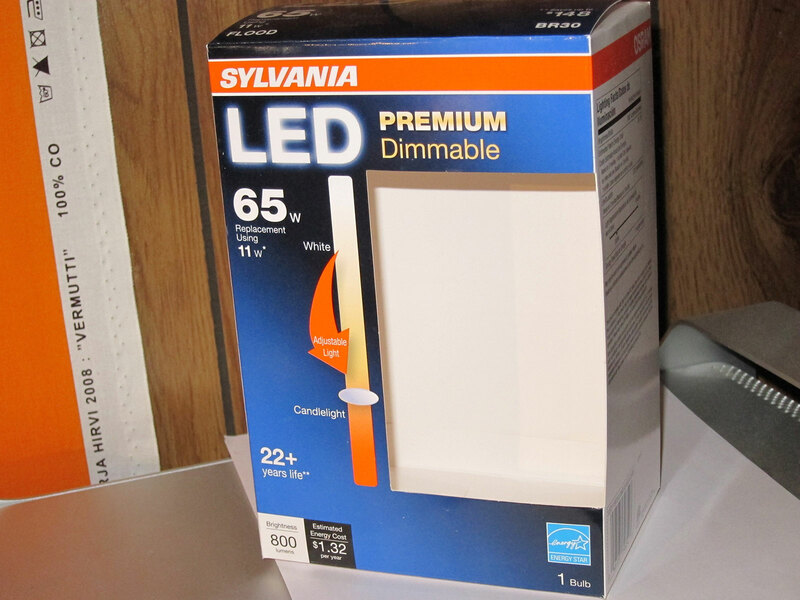 Because my local big-box building store put them on sale for less than $5, I bought six bulbs that changed color from 3000k (slightly whiter than incandescent) to 2100k (the official color of candlelight) when dimmed. Bathing is also about relaxing so this is a very nice touch. I wasn't very excited about installing a vent fan. There wasn't an obvious place for one in the crowded ceiling. They make quite a bit of noise so one is tempted not to use them. This was a basement, after all, with plenty of air movement. It had to be installed over one's head with all the problems that entails. Installation is MUCH harder than it looks because a good one would consider airflow management and straight connections with the outside. 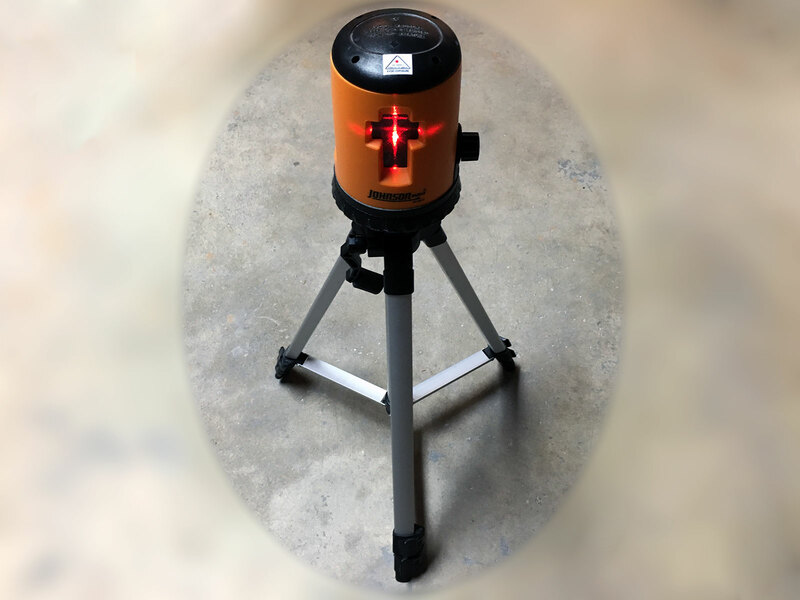 But the partner insisted, a Panasonic FV-11VQ5 WhisperCeiling 110 CFM Fan was found on Amazon for less than $125 with a solid-state timer, and a spot was found with a straight shot to the outside wall. 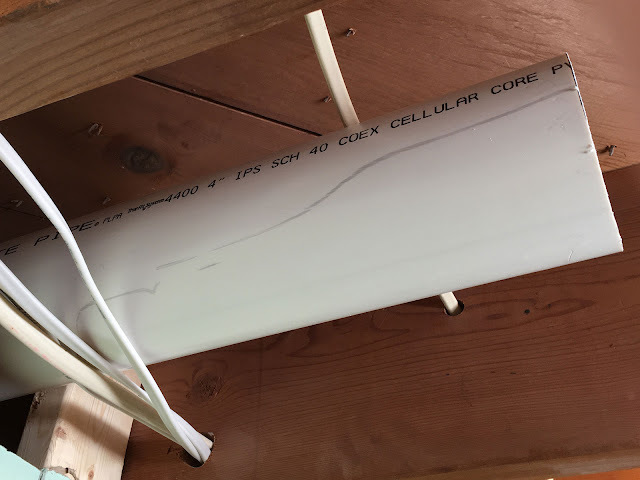 A 10' hunk of 4" PVC would connect to the outside cover. 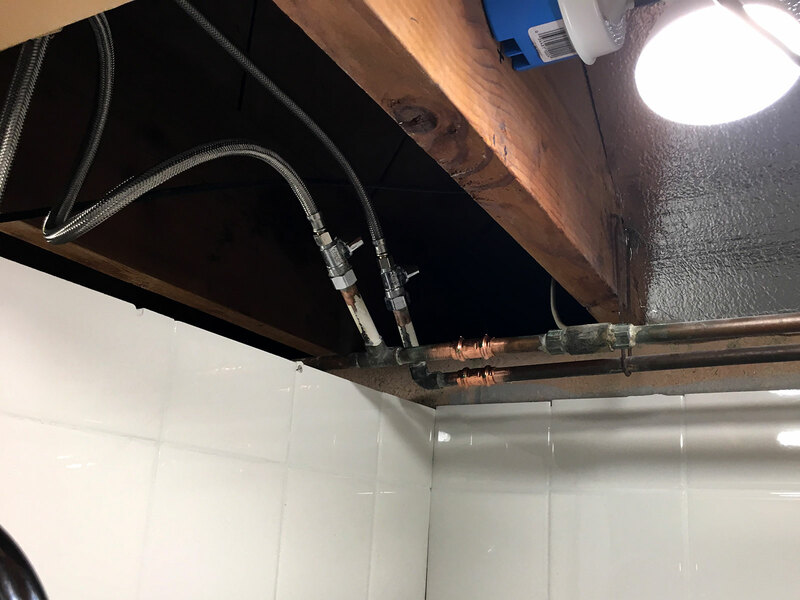 There was NO way to maneuver such a pipe into the crowded ceiling space so it was cut into three pieces and joined in progress. The water supply pipes of the old bathroom were in the way. So they were cut off and replaced by some shut-off valves. This was fine as long as construction was underway. But the concrete stub walls needed to be extended to provide maximum headroom in the shower area. When this was done, the supply stubs were quite obviously in the way. So either the water supply would have to be exposed or those stubs would have to move. The solution was actually pretty simple. The supply pipes were cut and rotated. A 5' (1.5 m) braided stainless steel line was attached. These were attached to a well-located block and dropped straight down to the new shower faucet. 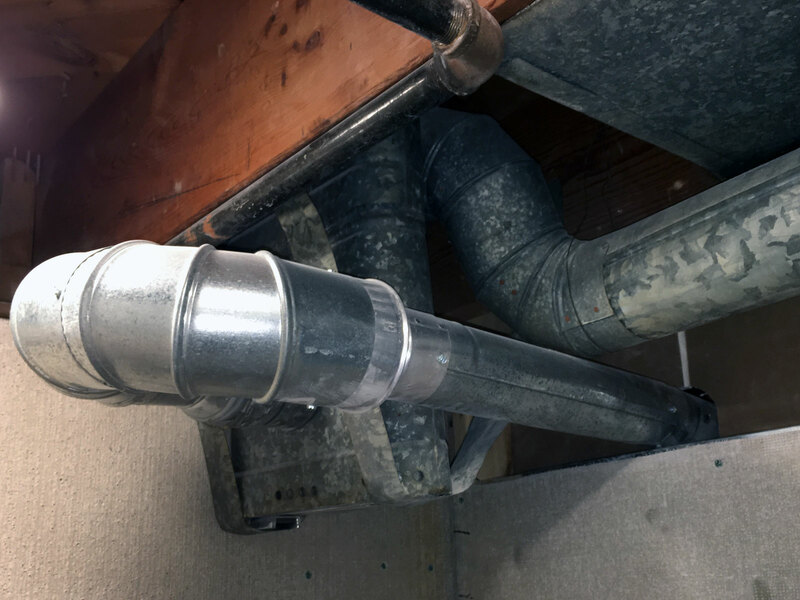 The pipe from the furnace gets a more permanent hookup. 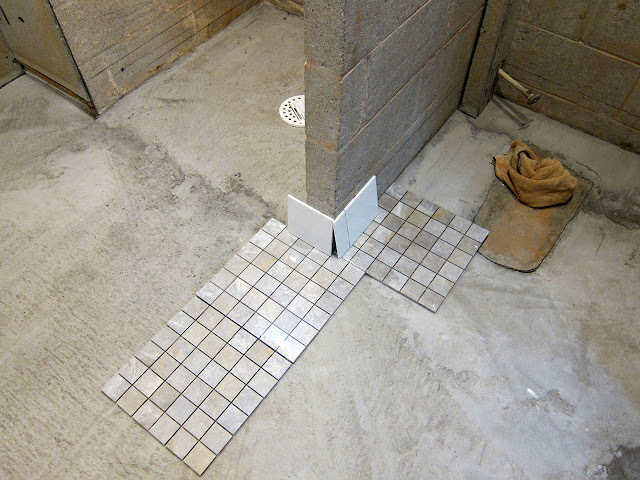 The copper pipe had to be small enough to be buried in the tile's substrate. This pipe maze was for the hot water heater. 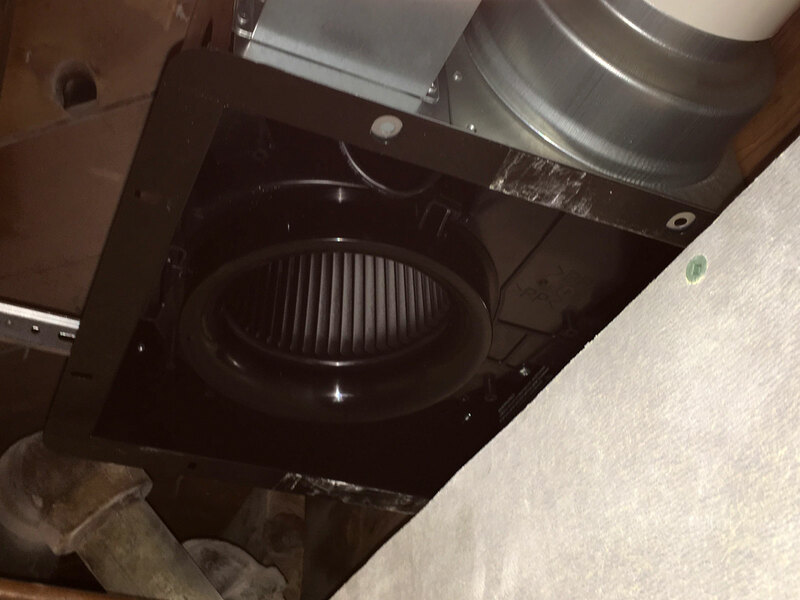 The furnace had long ago been replaced with a positive ventilation system so only the water heater needed a chimney at all. 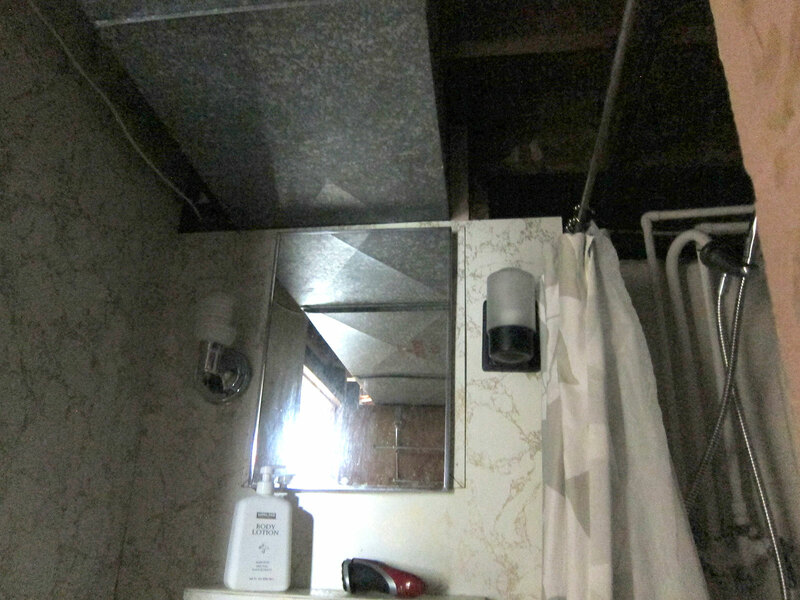 It lowered the ceiling height over the toilet to less than 6'3" (1.9 m). So the decision was made to replace the water heater with a positive ventilation system. Wish I had made this decision at the beginning of the project because framing around this mess was a major headache. This is the ceiling without the chimney. Still some ductwork in the way but a MAJOR improvement anyway. Parts for suspended ceilings are widely available, extremely versatile, and remarkably inexpensive. Good thing because my ceiling was a mess with pipes and wires, lights and fans, and needed something to cover up that ball of confusion. The grid parts are all plastic so there is nothing to rust. The mounted piece here has been installed using teflon-coated screws set in plastic anchors. Bathrooms get wet, you know. All the ceiling parts cost less than $100. A square plastic grid was chosen for the drop-in panels. There are dozens of diffuser panels to choose from but these let the room breathe and allowed the vent to work properly. The new laser level made it easier to place the row of diffuser panels between the ducts at the same level as the shower ceiling. When those ducts get painted to match the walls, it will look even more unified. The grab bars were attached to the concrete block walls using stainless steel Tapcons. The ones around the shower may look a bit random, but were placed after a LOT of thought. They work amazingly well. I now joke that if I fall in this shower, someone should call the cops because I have obviously been pushed. I think these grab bars are extremely well designed. There are no hard corners, the space between the bar and wall is too small to trap an arm, and the knurled surfaces prevent slippage even if one's hands are soapy. 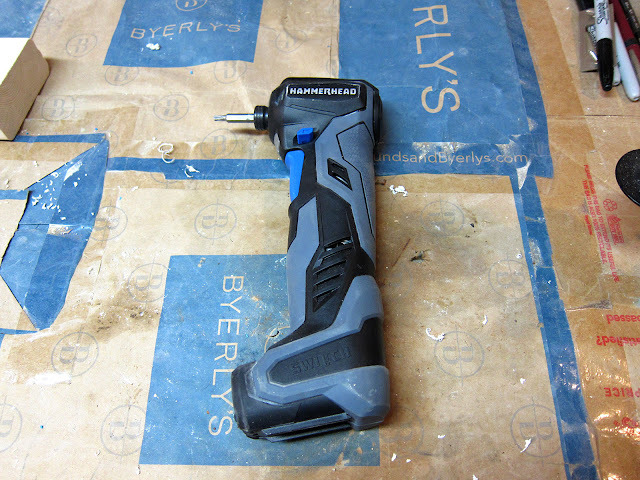 For years, I have avoided buying (or even renting) a proper hammer drill. 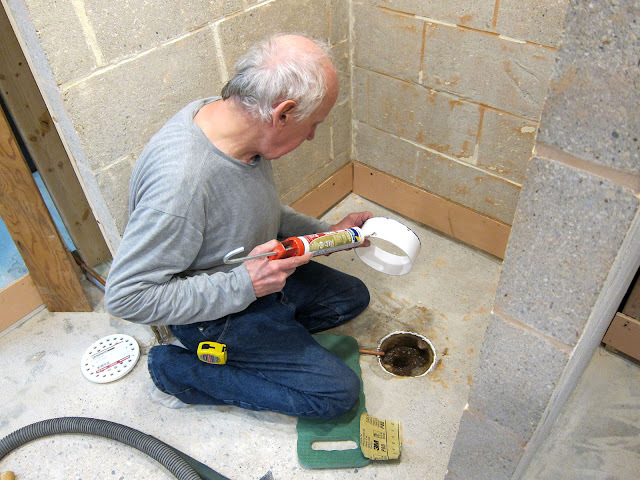 I put holes in concrete so seldom I had always made do with some carbide bits, a conventional drill, and diligence. This project would involve a bunch of holes in concrete so I finally bought a 1/2" corded example which worked better than I ever imagined. Apparently I waited long enough because my big-box supply store sold me this one for $17.99. 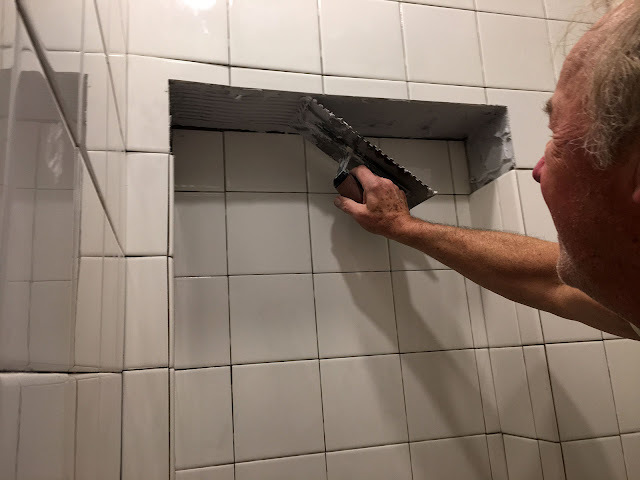 The small bit made the pilot holes for the SPAX screws used to mount the shower fixture, the medium bit made the pilot holes for the Tapcon screws used to mount the grab bars, and the big bit made holes for anchors. This is the laser level I bought. 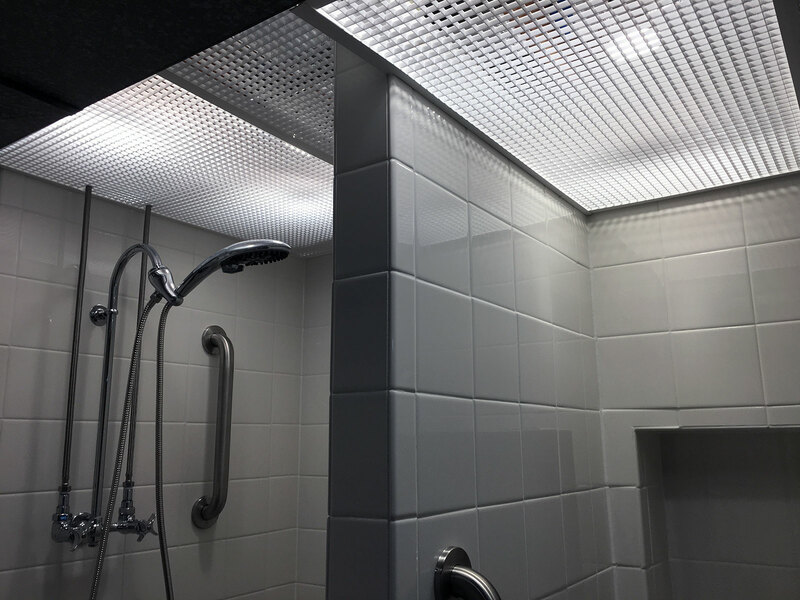 It is not nearly so capable as the Stabila LAX300 used to recontour the floor, but it was plenty good enough to get all the wall tiles to line up and the ceiling to be mounted straight with the world. $90. The original framing was done with an impact driver that came with my friend from Denver. His was a DeWalt and with batteries and a charger, I could have one for about $300. The Hammerhead below had nowhere near the power of his but could drive 2.75" #9 construction screws and did a fine job with those 1/4" Tapcons. It just couldn't do very many and when it needed to be recharged, the whole tool had to be plugged in. It also had an an attachment that operated as a small hammer that was useful for wire staples. Absolutely loved my little $60 Hammerhead. Could not have done this job without it. 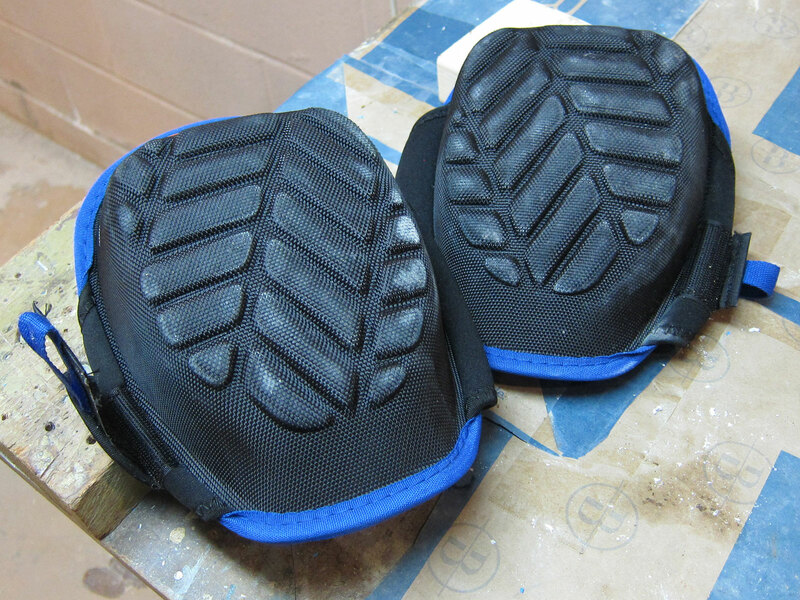 Way more work was done on my knees than I could have survived without modern kneepads. These had gel inserts and cost only $25. I may have had problems standing back up after working on my knees for awhile, but my knees themselves never hurt thanks to these things. 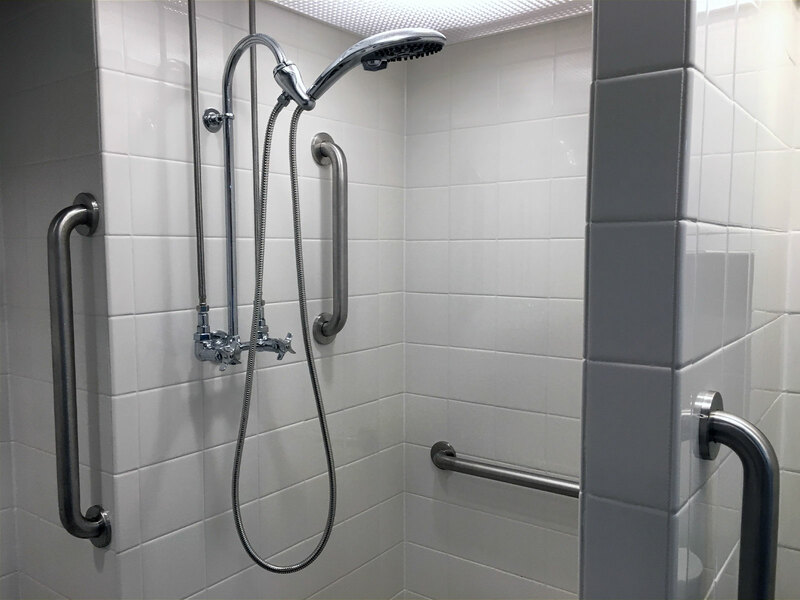 Showering with elbow room, no-slip flooring, a wider door, and plenty of light is a giant step in the right direction. Goals were met but damn was it a lot of work. Love my new bathroom / shower. It should serve me well for a long time.